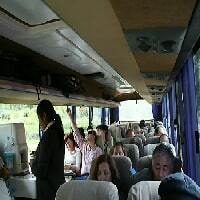 Inka Express is a Peruvian tourist transportation company with many years in the market and a dedication to quality services in the most popular tourist destinations of Peru. Inka Express helps travelers arrive where they need to be either at Cusco or Puno. Each Inka Express Bus is custom built with their specifications, configured to provide unparalleled comfort for 40 individual passengers. For your comfort, their bus cabin seats 40 and is outfitted with VIP seats. There are two rows of seats, 2 seats on one side of the aisle and two on the other – maximizes legroom and privacy. The cabin has oxygen on board, so you can safely travel in high altitudes. Tickets to the tourist attractions of Pucará, Raqchiandy Andahuaylillas.